For the second year in a row, Tracee Ellis Ross is back as the host for the 2018 American Music awards at the Microsoft Theater in LA on Tuesday(October 9th). Via her intagram, the actress noted that her looks will pay homage to the culture. Tracee wore looks courtesy of black designers and her red carpet look was by PYER MOSS. 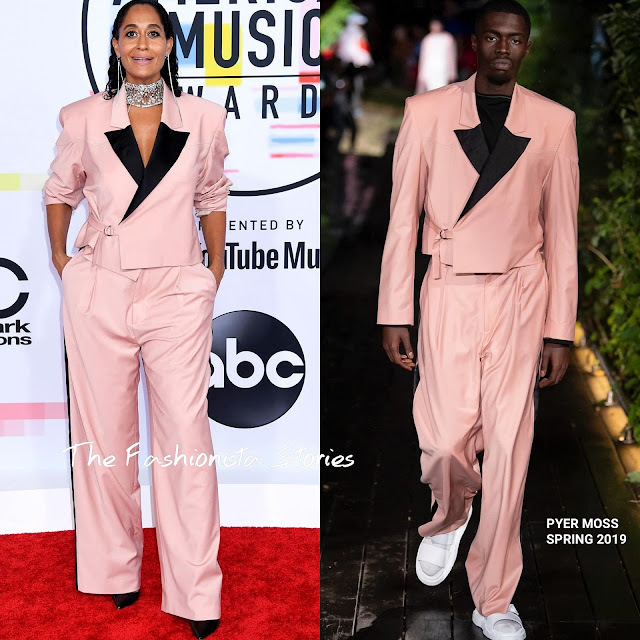 Her SPRING 2019 pink & black panel suit was a great choice but I am not feeling the fit of the pants on her. Also I don't think she needed the JACOB & CO necklace. She finished up with DJULA earrings, CHRISTAN LOUBOUTIN pumps and pulled back curls.